It has happened to me three times this month. The first time it was a regular Saturday evening, and I quite fancied my last bottle of Couly Duthiel's 1996 Chinon 'Baronnie Madeleine', a relatively inexpensive but tasty Loire red. I popped the cork, and there it was -- instead of the bright, leafy raspberry fruit I would normally expect from this wine, there was the musty, damp-cardboard-like smell of cork taint. No worries, I could take the bottle back, and although the replacement was the slightly less good 1997, it is still a nice wine. The second time was at a BYO restaurant with my online wine friends Nick Alabaster, Tom Cannavan and Peter May. Nick had brought along the 1994 Petit Verdot from Dominio de Valdepusa, a wine I had been itching to try for a while and which is no longer available in the UK. We took a sniff, and then a slurp -- something wasn't right. Gradually we realised that this wine was indeed tainted, albeit at a low level. There was a slight mustiness, and the nose -- which should have been full and ripe -- was almost completely flat. It was a real shame, and there was no way of getting another bottle. Finally, the third occassion was on Christmas day, with a bottle of Errazuriz Syrah Reserva 1998. Although this is a bottle that can be easily replaced, it is still a major frustration when a replacement is not to hand. 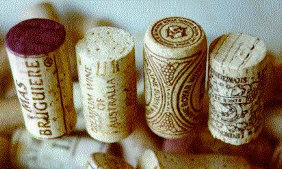 The fact is, some 5% of bottles of wine are ruined at source by cork taint. Some estimates are higher than this; few are lower. Of course, retailers will take back spoiled bottles, but this is only a solution when the wines are still on the market. Bear in mind that if you have a case of expensive 1982 Bordeaux in your cellar, that there is a more than 50% chance that one of the bottles will be tainted, and should this be the case, it is impossible to get a replacement from your wine merchant (the wines are of course no longer readily available). And should you be able to remember where you actually purchased the wine from in the first place and secure a refund, this will be but a tiny fraction of the current value of the wine. Or to put it another way, in my modest cellar of some 200 bottles, the chances are 10 will be corked. This is an upsetting prospect. Four different types of cork. Left to right: a good quality one-piece cork; a 'Twintop' technical cork with agglomerated cork paritcles sandwiched between two discs of real cork at either end; an Altec-style agglomerate cork made up of cork particles glued together; and a lower quality one-piece cork. Three different synthetic 'corks'. Potential solutions? I find it baffling that there are many wine lovers who are still prepared to put up with this unacceptable failure rate. The wine trade seems to have an irrational loyalty to corks, a luxury that I suspect is partially maintained because they do not have to pick up the tab for the bulk of spoiled wines. Instead, consumers do. Geeks like myself may be willing to return wines, but the majority of people are either uncertain enough of their diagnosis, or fail to spot the taint (instead just thinking the wine was a poor one), or lack the will or courage to take the wine back for a refund. For reasons of aesthetics and tradition, it would be lovely to keep corks, but the bottom line is the startling statistic of 1 in 20-40 ruined bottles. It is widely held that better quality corks suffer a lower rate of corking, but rather surprisingly this does not appear to be true -- although high quality corks will suffer a lower rate of mechanical failure (an important issue when the wine is to be cellared for 30 years), they seem to have the same frequency of taint as less expensive versions. The fact is, there are inexpensive synthetic closures that will could solve the problem of corked wines once and for all. 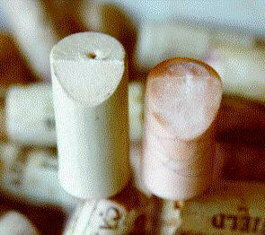 While Stelvin-style screw caps or crown closures may never have sufficient consumer acceptance for widespread use, synthetic 'corks' are becoming more and more commonly adopted, in particular for inexpensive wines. The most widely encountered synthetic cork is the supremecorq, a one-piece construction made from tough, swirly-patterned plastic. Although I'm pleased to find these in the neck of a bottle -- it means the wine won't be corked -- they are not very pretty and can be hard to extract. A less common design is the two piece plastic construction which looks and feels much more like the real thing. I hope that these become more widely adpoted. Of course, for fine wines designed for extended cellaring, no one knows quite how these synthetics will perform over decades in the neck of a bottle. Part of me feels that it is a risk worth taking, simply because of the horrendous failure rate of real corks. Two different types of synthetic cork, with sections cut away to illustrate the differences. 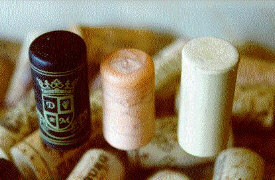 The cork on the left is of a two-piece design, with an extruded core and a smooth, hard outer casing. The supremecorq type on the right is a one-piece design, and is by far the most commonly encountered synthetic. However, the two-piece design is in my opinion a much better quality product, and behaves much more like a traditional cork. As you can imagine, the cork industry is rather worried about the growing consumer awareness of its dirty secret, and the availability of inexpensive alternatives that don't suffer from the same problems. Scientists are busy trying to find ways of treating corks to eliminate the contaminant, TCA, so far without success. They have even enlisted ecological arguments: apparently, the cork forests of Portugal are an important habitat for a number of rare species. However, this is a smokescreen. If the cork forests are worth conserving, then of course they should be conserved, but it doesn't follow that wine drinkers should foot the bill. It's a bit like environmental blackmail! In order to fight its corner, the cork industry is spending large sums on PR. Amorim, the world's largest producer of corks, has over the last few months been flying wine journalists from across the globe to its Portuguese headquarters. I recently made some investigations and was given the names of certain UK journalists who had enjoyed hospitality from Amorim. Interestingly, one of these individuals had recently written a rather pro-natural cork piece. I'm not suggesting that there is any corruption involved here: I think it is perfectly possible to take free trips and still write a fair and balanced piece. But do expect more stories on cork to be published in the next few months, and for some of them to have a pro-natural cork message. Don't get me wrong. I love corks. Aesthetically they cannot be matched. Pulling a cork is part of the tradition of wine. Having said this, the one issue we cannot escape from is that natural cork is incurably flawed in that it ruins some 5% of the world's bottles of wine. And when there is an alternative available that will inexpensively solve this problem and allow us to retain our corkscrews, surely it is time for change.